At my school, we bookend the week with an all-school meeting on Monday morning ("Pick Me Up") and on Friday afternoon ("Kick Me Out"). These can be a terrific time to have vibrant presenters, acknowledge student accomplishments and build the school community. But because there may be 100, 300 or 500 students in the room at the same time, participation can be a challenge. And building dialogue and a sense of engagement can be even harder. "Ok, everyone, please take out your phone...."
Now some of the kids might think you are about to confiscate them... but they will instantly be engaged. 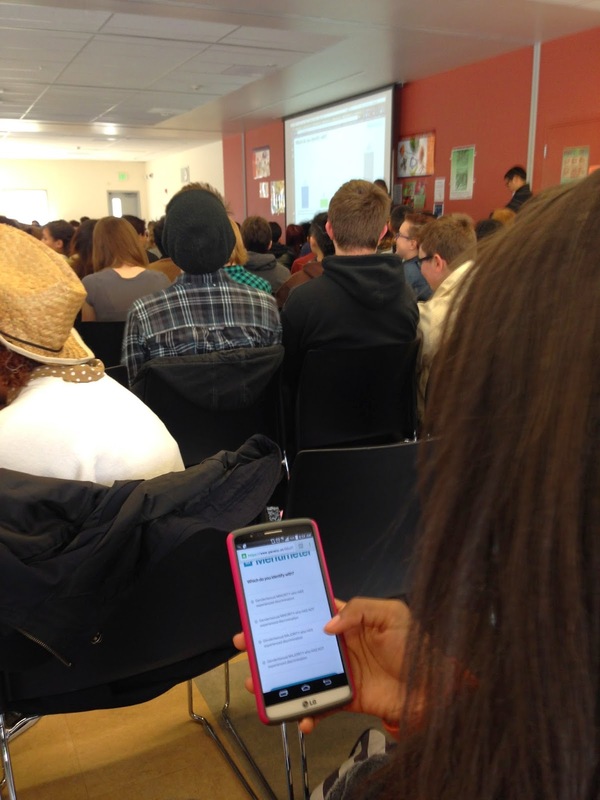 With online polling, any student with a phone can participate and results appear right before their eyes. Modern polling web apps enable you to moderate a vibrant discussion with hundreds students at a time. Your polls can be silly. Your polls can be controversial. Your polls can be about your school. Your polls can be about your students. Your polls can build engagement at the end of a presentation, or get kids interested before a speaker comes on. 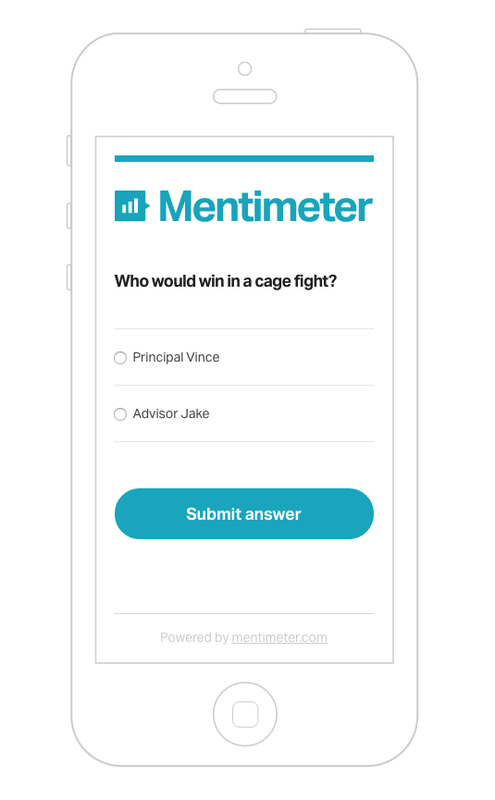 At one recent 'Kick Me Out' we used goofy polls about what advisor could beat our principal in a cage fight (he is an ex-cage fighter.) At another advisory we used polls to lead a powerful discussion about the pervasiveness of discrimination. And another poll we used to have participation about plans to purchase an online library and how students might use it. There are several good online polling services. (See table below.) My current favorite is Mentimeter. Their polls are interactive and fast, plus they allow unlimited responses. They are pretty cheap - free for single question polls and around $5 per month for lots of question types and larger polls. It is worth noting though that PollsEverywhere, while a lot more expensive, allows you to moderate free form responses - critical to keeping free responses appropriate. PollsEverywhere also has the option for kids to text in their response, making it easier for those without a smart phone. Be warned though, that all but the most expensive version of PollsEverywhere limit the responses to 40, way too few for full school participation. Whatever service you use... using online polling is a terrific tool to get participation in large school meetings. It was just a magical event! I was very passionate about what was told during these two hours. I learned a lot about the dynamics of modern education and how to work with these. 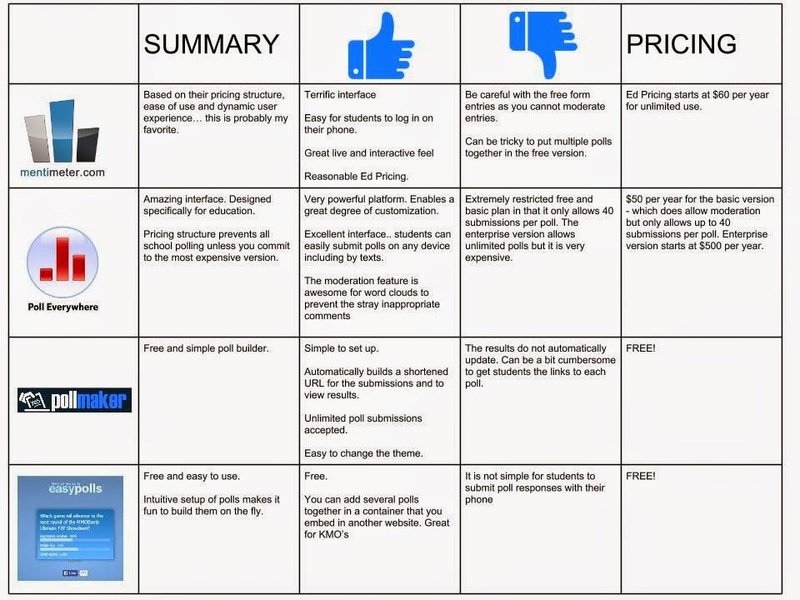 Today I have seen this only on https://edureviewer.com/services/unemployedprofessors-com-review/ where are collected reviews of the best services for writing student work.